Chicken caprese makes a quick and easy meal that is always a favorite! 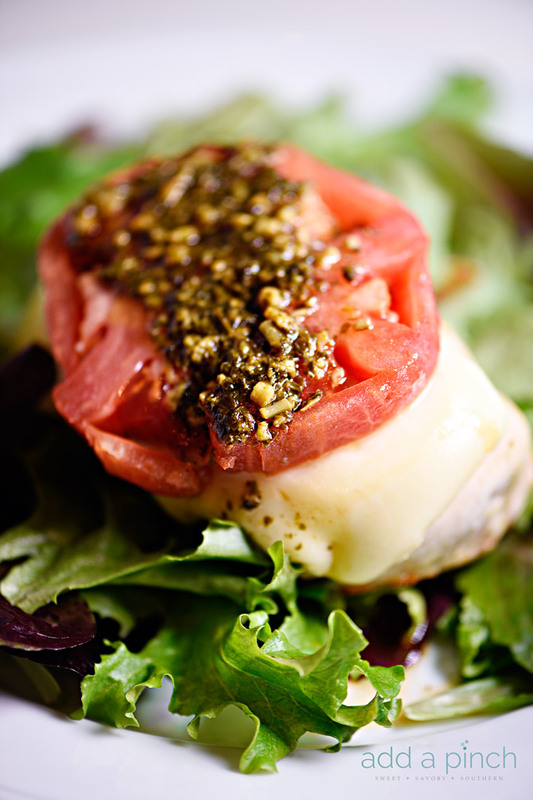 This baked chicken caprese is made with chicken, mozzarella, tomatoes and pesto! I love the flavors of caprese salad. The blending of the creamy mozzarella cheese, tomatoes, basil and the touch of balsamic vinegar are just absolutely delicious and something that I never ever ever ever get tired of eating. Add chicken to it and you better bet I’m all in! 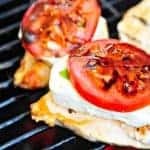 Years ago, I shared my recipe for Grilled Caprese Chicken that we love to fire up the grill (or grill pan!) to cook for supper. And, I’ve shared our Caprese Chicken Pasta that is one of our favorites, too! 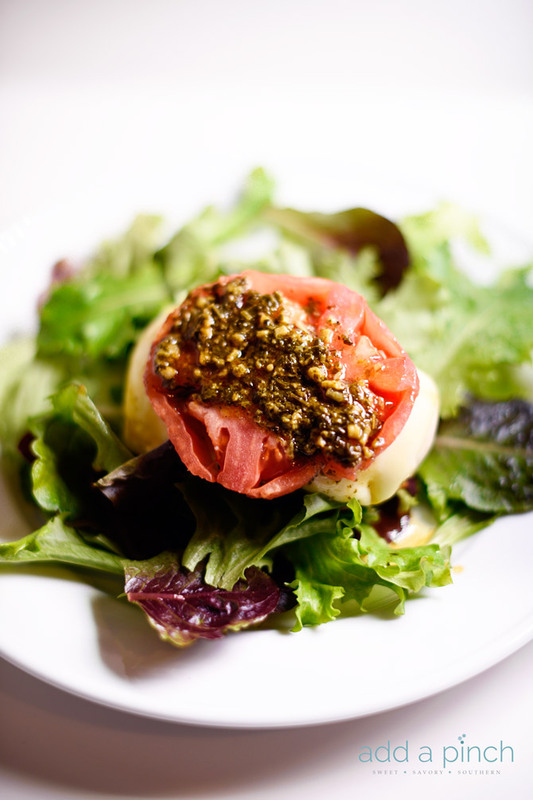 The other night I had a huge craving for those signature caprese flavors that I just couldn’t shake. I know when that happens, I might as well address the issue head on and just make it for supper! Thankfully, since this is a dish that my whole family loves, there is no guilt about selfishly fixing something that I’m craving and the rest of the family just endures. Not with this dish! Being out of fresh basil, I improvised by using pesto that I’d made and saved from the summer. 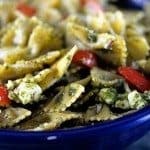 I have to tell you, we loved it so much that now I’m thinking all of trying all of my caprese recipes with a bit of pesto thrown in for good measure. It was absolutely out of this world! 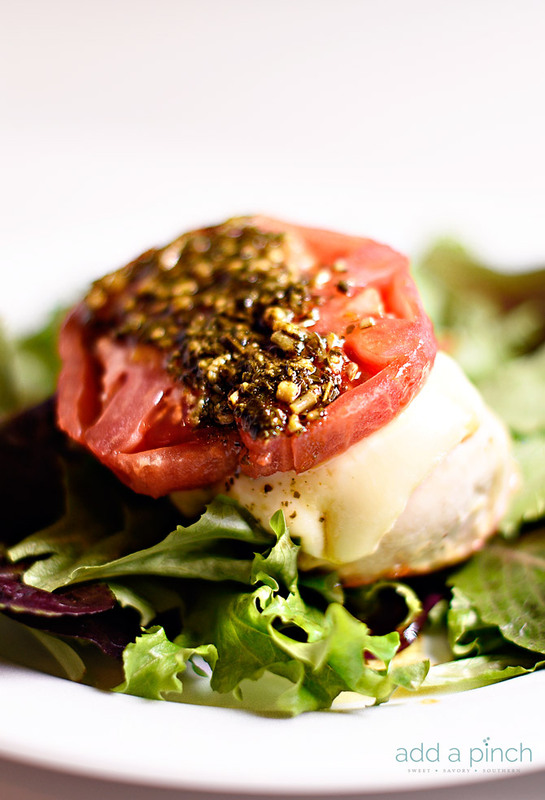 It really couldn’t be simpler to make my baked chicken caprese. Here’s how I did it. I drizzled a little olive oil into a medium skillet and then added my boneless, skinless chicken breasts. I baked them until they were completely cooked through and then I topped them with mozzarella and a slice of tomato each. I returned them to the oven until the cheese had melted and then I topped each tomato with a bit of pesto and drizzle of balsamic glaze. Then, I just served them on top of lettuce greens. Supper was ready and on the table in 30 minutes, but devoured a whole lot more quickly! It was exactly what I’d been craving and thankfully, everyone loved it as much as I did! 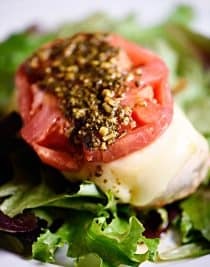 Here’s my Baked Chicken Caprese recipe. I hope you enjoy it as much as we did! Preheat oven to 400 degrees F. Drizzle about 1 teaspoon olive oil into a medium skillet. 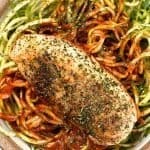 Arrange chicken breasts in skillet and drizzle with remaining olive oil. Sprinkle with salt and pepper. Bake chicken until juices run clear when pricked with a sharp knife and it is no longer pink, about 18 - 20 minutes. 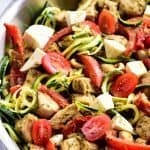 Top each chicken breast with mozzarella slice and a slice of tomato. Bake until cheese melts, about 3 minutes. Remove from oven and top each chicken breast with about 1 tablespoon of pesto and a drizzle of balsamic glaze. I’m going to make this tonight! But…how do you make a balsamic glaze? Love your blog. I found a recipe online for a glaze and I had pesto that I made in the freezer. I always ask my husband if my new recipes are keepers and he said Yes! to this one. A great healthy dish to start the trend.. This chicken looks so good. Thanks!